No, I don’t intend to regale you with my adventures in the Clone Wars—I just wanted a bit of atmosphere to introduce my topic. And my topic is rayguns. These handy little (sometimes not so little) implements of destruction are one of the oldest gadgets in science fiction. And since superhero comics are practically pure science fiction, the ever ubiquitous raygun has been lending its flash and dazzle to that scene also since 1929. What I intend to do in this article is present a gaming aid (charts and dice—hooray!) that will enable any gamer to create ray weapons for use in any superhero or space role-playing game. I warn you now that this Raygun Matrix has been especially developed for the T & T variant superhero game that I’m currently working on, but it should be easily adaptable to almost any system. To use the Raygun Matrix you will need a 10-sided die (hereafter called D10) and some paper to record the description of the weapon. To use the Raygun Matrix simple roll the D10 once for each column on the table. Seconds later you will have a complete description of a new weapon. There are some 30,000 individual varieties of ray weapon that can be generated by this table—with a little imagination and window-dressing on the part of the players who use the weapons, there should never be a duplication. If the table seems self-explanatory, you can quit reading. For those who still have questions, stick with me a little longer while I define some symbols and lay down some definitions to explain what the table means. I’ll also talk about Range and Charge, which you don’t see listed on the table. Now a few words about the weapon types. A stunner is a weapon that is designed to knock out living beings (especially carbon-based, oxygen-breathing lifeforms such as humans). They can kill, but must deliver 10 times as much power to kill as to stun. They stun by delivering enough energy in terms of hits of damage to equal or exceed the victim’s hit point rating or constitution. Stunner damage is cumulative, but it wears off quickly if not continuously applied. On the other hand, the Lethal weapon is your basic death-ray. When a lethal weapon hits, it does crippling damage immediately. When hits from it equal or exceed the character victim’s hit point rating or Constitution, the character dies. The special effects weapon needs some explanation. It has been put on the chart especially to cover all those weapons with unusual effects such as shrinking the object struck, or turning the target invisible. When this comes up, the player may be as creative as he/she wishes (only once per weapon, please). This is carte blanche for magic. The heat beam (cutter) is the equivalent of today’s modern industrial and surgical lasers. They cut very precise holes in whatever they hit within range. The heat beam (disintegrator) works on a different principal. They convey so much heat energy to the molecules and atoms of the object struck, that the valence bonds are broken and the object literally flies into pieces, usually gaseous. The heat beam (burner) isn’t quite as powerful. It can’t cut holes, and it can’t explode, but it can rapidly raise the temperature of the struck object to its combustion point if such is below 1000 degrees Centigrade. The imploder weapon strengthens the strong and weak nuclear forces acting within atoms to cause rapid and violent condensation of the object struck. I have a weak stomach and will not describe what would happen if such a ray struck human flesh, but remember, only the part of the body actually struck by the ray would diminish in size. The disorienter cannot be directly fatal. It works by adding spurious input to nerve cells within the body and the brain. Under the effect of a disorienter ray, the character would have no accurate representation of reality—he might hear colors and smell pressure. It should be fun describing the effects of a disorienter to players in a game. The electrical shocker is ideal for stopping any object that uses electrical current. That includes human and animal bodies, which use tiny electrical currents to carry nerve messages. The shocker is actually a lightning bolt projector, and will require its user to be very well insulated. Multi-purpose means just what it says. If you roll this result on the chart, you will gain a weapon that is good for more than one of the above functions. Roll twice more on the Type column. Any multi-purpose roll is worth two more rolls, but if you should get a weapon with more than 3 possible modes of application, give us a break, please and stop with three. The Color column should need no explanation. A roll of 4, for example, on this table would give you a blue ray. If you don’t like my colors, feel free to replace them with anything you prefer. The Power column shows how much energy in terms of hit points the weapons can put out. Let me emphasize that this is a separate roll from the ones that produced your type of weapon and color of ray. Most of the power outputs are fairly low. This was done deliberately in order to give characters some kind of chance to survive after being hit with a ray. However, it is unlikely that anyone short of Superman or the Incredible Hulk could survive a thousand hits at a time. The X at the bottom of the Power column indicates a multiplier. If the X comes up, roll 2D6 (doubles add and roll again) to get a multiplier. Then roll again on the chart to determine which power is multiplied. (Example: I have created a Death ray with a black beam. Rolling a 10 under power, I note that I get a multiplier. I roll 2D6 and get a 7. Then I roll the D10 again, getting a 1. My death ray has a power of 7D4. If the X comes up more than once in a row, just roll up a new multiplier and add it to the first one. Most of the things in the Form column are self-explanatory. Remember that rayguns should tend to be large and garish in design unless your character has some particular need for secrecy. 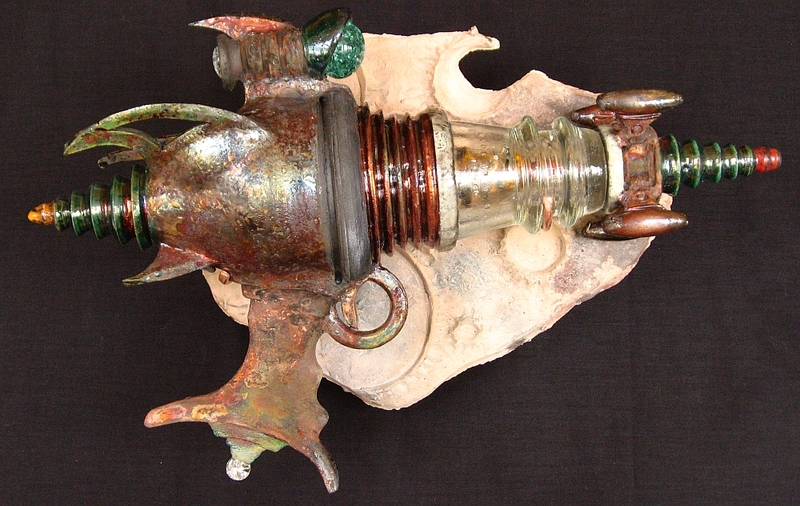 A Device is a Raygun that is camouflaged to resemble something else such as a pen, mask, mirror, armband, dagger, etc. A Projector is any raygun that looks like a light-projecting device such as a flashlight, searchlight, x-ray machine, etc. Under Output there are two basic options; pulse and beam. A pulse is a burst of energy that lasts for ½ second or some other insignificant length of time. A beam is a continuous flow of energy for as long as desired. Damage is calculated as the initial damage done in the first second times the number of seconds under the beam. Both means the weapon can be used in either mode as desired. There are two more important topics to discuss: Charge and Range. Charge is the measure of how many shots the gun can put out before being exhausted. Range is the distance the ray will travel before losing enough energy to become harmless. Every raygun will have a charge. For Pulse weapons the charge number equals the number of shots the gun has before it needs recharging. For Beam weapons the charge number equals the number of seconds the gun may be fired continuously before it needs recharging. To determine the charge for a gun when creating it, roll 2D6. (Doubles add and roll over.) The creator or owner of a weapon will know how to recharge it. Recharging always takes as many minutes as the charge number. Guns with a Powerpack have 100 times the regular charge number. Ray cannons have 1000 times the regular charge number, but require a constant supply of new energy. Projectors need not worry about charge—the charge is inherent in the material of the projector—but the charge number will be used to determine the number of hours the projector will last in use (continuous or sporadic) until it burns out. All rayguns have range and that is a function of their power. Range equals the number of faces on the die (or the number of absolute hits such as 1000) times the number of dice or other multiplier times ten in meters. For example: the deathray created earlier that has 7D4 worth of power would have an effective range of 280 meters. If a raygun’s range is exceeded, the power in terms of hits delivered falls off exponentially by powers of two. See table below. R = range, H = number of hits rolled. Quit calculating the range of a weapon when the maximum amount of damage it could do is less than 5 points. Only the very weakest of foes and objects are going to suffer from less than 5 hits of damage. The only topic left to discuss is how to determine whether the raygun user can hit what he or she is aiming at. This is going to depend on the system being used. In a Tunnels and Trolls like system the ability to hit would depend on making a Dexterity saving roll. In Traveller, it would require a base roll of 8 or higher on 2D6 after accounting for variables that might modify the shot. You players should know your own systems best and how to determine when a missile weapon hits (Rays are basically missiles even if the missile in question is the lowly photon). That finishes the explanation of the different types of rayguns. I’d like to say a few words about how and when to use the raygun table. It has been pointed out to me that in a consistent universe, rayguns will tend to be standardized for greater efficiency in manufacture and repair. That is undoubtedly true. Let us assume that police forces in the 23rd century use a multi-beam weapon that can either stun or kill. After choosing those two types of rays off the table, the GM would go through the rest of it and determine that the stun beam was white and had a power of 1D10 while the lethal beam was purple and had a power of 100 hits. There is no point in rolling for the form of the raygun because the pistol form is desired, and no point in rolling for output because a pulse is desired. Rolling 2D6 we get a 7 for the charge of the weapon. The stun beam has an effective range of 100 meters, while the lethal beam has a range of 1000 meters (different ranges because of different types of rays). Now, the weapon is created. Rather than go through this whole procedure every time I wish to arm a policeman, I just give them all the same weapon. In the world of the 1980s where microcomputers are common, there are already several hundred different varieties. There is no standardization. In the world of the 2080s I expect the same thing to happen. There will be as many different types of rayguns as there are companies manufacturing them. It has also been suggested that the laws of physics would determine the color of the ray. All heat ray weapons might have red beams, for example. This is, I think, a false generalization. Color in a beam of light depends on either the color of the source, or the color of the last translucent object that the beam of light passed through. Thus, to produce a blue ray, all one has to do is pass that ray through a blue lens before projecting it. The same is true for every color but black, and black beams could be accounted for by imagining that the projected ray dampens all reflected light from the space through which it passes. Lastly, one might discover that the random table might produce vastly incongruous objects, like a ray cannon that only does 1D4 worth of damage, or a flashlight that can do 1000 hits. True, it might. If such a result comes up the GM and players could do one of two things: (1) accept it (that ray cannon was really a lousy design, a prototype that didn’t work out too well—that flashlight was sheer genius, etc. ), or (2) modify it. A ray cannon with a powerpack giving it 7000 shots at a rate of once a second can do an awful lot of damage even at 1D4 per shot. And remember, although the table has been set up to be used randomly, it doesn’t have to be used in that fashion. The GM wanting to design a new raygun could use the table as a guide and choose what was desired in order to design new ray weapons. By GM fiat they could then become standard weapons for whole gangs of supervillains or races of alien BEMs. Now armed with ray weapons that can either fry a butterfly or blast big holes in the universe, go forth and conquer! Transcribed and with illustrations chosen by James St. Andre, June 12, 2012.